JAMES Pulham and Son were one of the most well reputed firms of gardeners of the late 19th and early 2Oth centuries. They created gardens in a wide range of different styles, but used to specialise in picturesque rock gardens, constructed from both natural and artificial rock. There were four generations of Pulhams, with each successive eldest son called James and each one continuing in the footsteps of their father. The first James Pulham (1788-1838) started the firm in London with his brother, Obadiah. The one big project for which they are now known was the building of a large Norman-style folly at Benington Lordship, near Stevenage in Hertfordshire. The second James (1820-1898) took over the company when he was just 18. He moved up to Hoddesdon, Hertfordshire, in 1842, where he had a number of contacts. 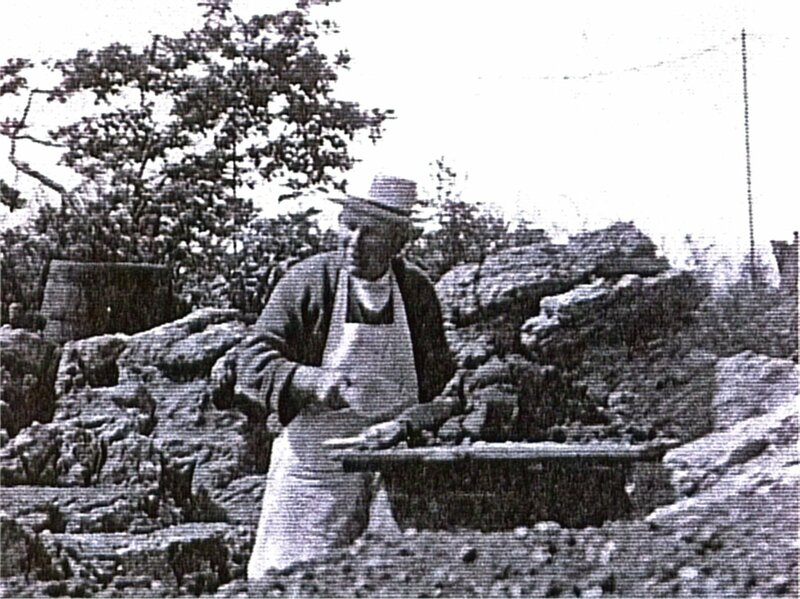 He set up home further south, in Broxbourne, where he built a manufactory in which he produced a wide range of garden ornaments from his own ‘Pulhamite’ cement and terracotta. The third James (1845-1920) entered the business in 1865, and, from this point it became known as James Pulham and Son. His son, the fourth James (1873-1957), was 25 when he became part of the company as the new junior partner. But the First World War and the following depression put a virtual end to large-scale landscape gardening work, because the money and the men required to undertake the garden maintenance were no longer readily available. The third James retired and died in 1920, and the fortunes of the firm declined steadily after that until it went out of business at the beginning of the Second World War in 1939. The records of the firm were all destroyed at this time. When the fourth James died, the family house and factory were demolished, in 1967. A MAN delvmg mto his family history may have unearthed vital information which could revitalise Preston’s parks. Hertfordshire man Claude Hitching, 74, was researching his family tree when he discovered that his grandfather, Fred, and four other ancestors used to work for the Pulhams, renowned in their day for creative masterpieces in UK parks. In fact, they were the brains behind some of the magnificent scenery at the Avenham, Miller and Moor Parks in Preston. Council bosses have now said they will use the new evidence as proof of the historical importance of Avenham and Miller Parks in a bid to secure the funding. They need £3m to return the two sites to their former glory. Mr Hitching’s findings will also make up part of a new book about the Pulhams, which will include detailed history about Avenham and Miller Parks. Mr Hitching said the Pulham records show that the firm worked in Avenham Park in 1866, and again in 1874-75. Avenham Park could see the restoration of many key features, including the summerhouse, the Japanese Garden, the Colonnade and the Belvedere. The bid is due to go before full council on Thursday February 20. It will then be submitted to the Lottery board.